This last week of November turned out to be one of the most memorable weeks of music all year. As one of week’s blockbuster projects, the release of JID’s highly anticipated album, DiCaprio 2 on Monday, November 26, marked a pivotal moment in the young MC’s career. Celebrating this, JID brought along BJ The Chicago Kid and Thundercat to the Tonight Show stage to deliver a captivating live rendition of “Skrawberries.” This live rendition focuses on the performers, with no major effects other than colored lights, allowing for the powerful tone and message of the song to be clearly conveyed to both the studio audience and the audience watching from home with ease. 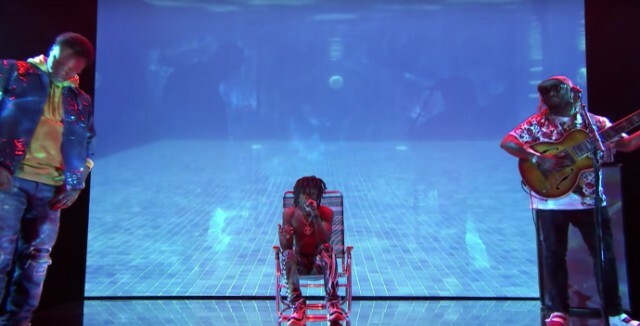 Also notable, JID takes a moment prior to the song’s start to dedicate the performance to Mac Miller who actually contributed to “Skrawberries” production. Watch JID’s live performance of “Skrawberries” featuring BJ The Chicago Kid and Thundercat on the Tonight Show with Jimmy Fallon below and tell us what you think of the new album and performance in the comment section!